Members of New Delhi’s Sikh community clash with police while protesting the release of MSG: The Messenger of God. Reuters. MUMBAI — India’s chief film censor, Leela Samson, resigned this week, saying she could no longer tolerate the interference of high-ranking government officials in her work. A second member of the film certification board followed suit on Friday, also citing interference. Though she did not mention it specifically, Ms. Samson’s announcement came after one of the board’s decisions was overturned, and a film called “MSG: The Messenger of God” was allowed to be shown. 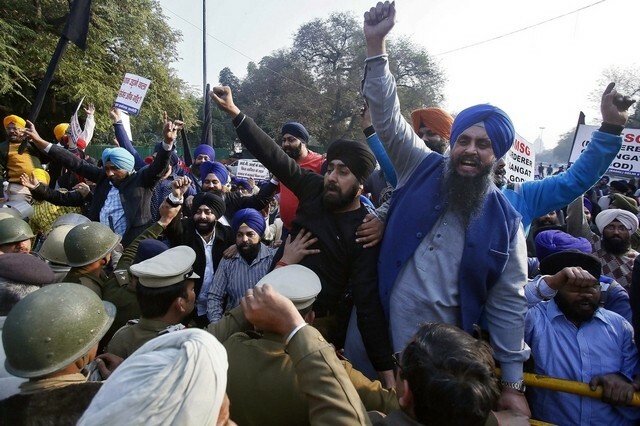 Sikh organizations call the film blasphemous, and protests broke out across north India after the news that it had been cleared for release. Ms. Samson said that government ministers regularly telephoned her and other film certification officials to press them to change their decisions. The panel Ms. Samson headed, the Central Board of Film Certification, has often been criticized for its tendency to err on the side of caution, and to order that dialogue and scenes with sexual content, violence or abusive language be cut from films before they are cleared for release. But its thorniest decisions involve films with religious content. Last month, the board resisted pressure from right-wing Hindu religious organizations to ban the film “PK,” which takes swipes at self-styled holy men and religious superstition. The film was exhibited across the country without major cuts. In the case of “MSG: The Messenger of God,” however, the board deemed the film unfit for public viewing, arguing that it would fan religious tensions. The decision was overturned by the Film Certification Appellate Tribunal, which rules in disputes over the board’s actions. The film features Gurmeet Ram Rahim Singh, the head of Dera Saccha Sauda, a controversial religious body based in the northern Indian state of Haryana. He is shown in the film performing miracles and fighting social evils. Sikh groups objected to its glorification of Mr. Singh, who has repeatedly been accused of blasphemy and who is facing several serious criminal charges. Before a screening of the film on Friday in Gurgaon, a city near Delhi, the police detained 60 people in an attempt to prevent clashes between groups protesting and supporting its release. Members of Shiromani Akali Dal, a conservative Sikh political party based in Punjab, protested outside the headquarters of the ruling Bharatiya Janata Party in New Delhi, demanding that the film be banned. A senior official in the Information and Broadcasting Ministry denied on Friday that government ministers had interfered with the certification board’s decisions about controversial films, even when there was pressure on the government to step in. Mr. Rathore said the government would now appoint a new film certification board to replace the current one, which was held over from the previous government when Prime Minister Narendra Modi and his Bharatiya Janata Party won power in May 2014. © 2016 Neha Thirani Bagri.